With 14 medals under their belt, the Bermuda Gymnastics Team has just finished a very successful first day of competition at the 2011 Island Games, with the gymnastics portion being held in Jersey this weekend. The senior team narrowly missed the gold in their team event, placing second to the Faroe Islands by 1.45 points. 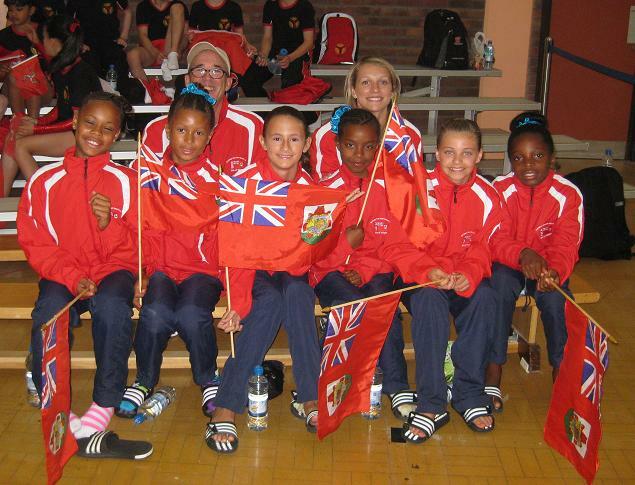 The Bermuda team also earned 4 individual gold medals, two individual silvers, and 5 bronzes. The total medals won for Day 1 was 14. Pictured below are [left] Tais Burgess-Allen who won gold on floor and silver on vault and [right] Kaisey Griffith who won several medals in the senior division. The girls return to action on Saturday with the optional competition. This is an individual event where the girls will compete their riskier, high level skills. - Photos by Alex Masters and Mandi Baughman. GO BERMUDA GO!!! You girls do us proud – you work really hard and you deserve it – WELL DONE TO ALL OF YOU and well done to the fab coaches as well!!! Well done Team Bermuda!!! Congrats to the coaches for all your hard work and time that you have put in…Yay for Harrington Sound Primary students past and present!!! Yay Zant!!!! and way to go Team BDA!! Superb! Wonderful write up and exquisite pictures. So proud of Team BDA. Keep up the great work ladies! Good job team Bermuda keep up the good work we needed some good news about Bermudains doing something good .Were are all the people that always have something to say what you can only come on when it bad news this is a plus for morning reading . Not everything in life has to involve haters, you know. Congrats Team Bermuda. You display another fine example of the great and positive things going on in Bermuda. Congrats Team Bermuda. You have ALL worked so hard to represent our Country Bermuda and we are all so proud of you ALL. Coaches your Team Bermuda you must be very proud and thanks for all your hard work. Love all your SMILES!! Well Done Bermuda Team !! Tomei you did an excellent job, keep pushing forward !! Yes Great Job Bermuda – Mandi & Duke and the rest of the coaches and parents, etc. Hard work and sacrifices have paid off. Tomei, Nana and family are so proud of you. Keep it up and the high points will come. You did good. Love you baby!!!! Congrats team Bermuda. We have the talent, just need to invest more in our talent.